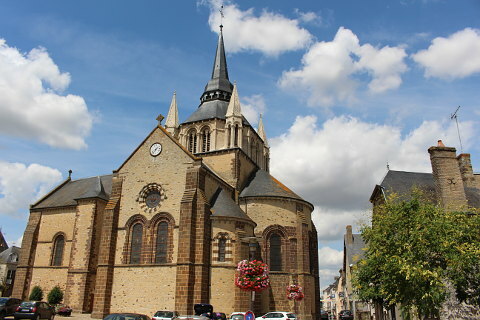 Fresnay-sur-Sarthe is a small town on the banks of the Sarthe river to the north of Le Mans and south of Alencon, with Beaumont-sur-Sarthe a few kilometres to the south-east. The town has received the official tourist classification as a 'small city of character'. 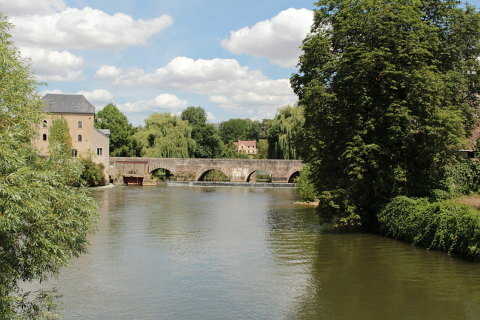 The centre of Fresnay-sur-Sarthe radiates out behind its castle and gardens and below these is a meander in the river Sarthe. On the edge of the old town and near the parking where you will most probably arrive is the church of Notre Dame. 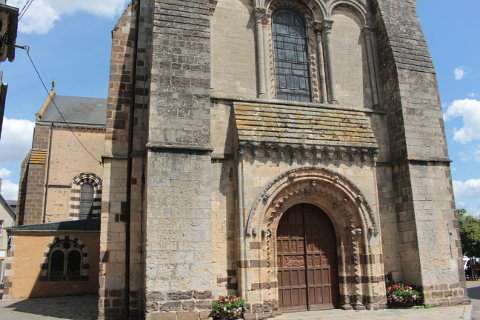 An attractive church built of a honey-golden coloured stone and with striped brown and cream stone decorating its arches and columns both inside and out. Next to the church blocks of stone mark the spot where the original entrance gate to the fortified old town was situated. Walking into the heart of the old town the streets are lined with attractive two and three storey stone houses with an occasional half-timber house too. 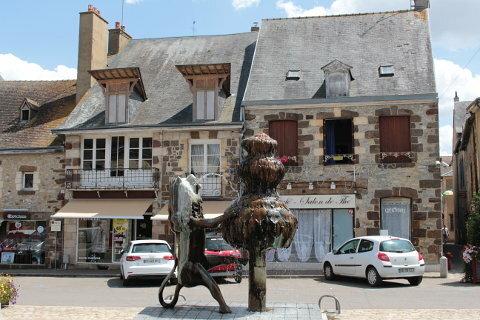 At the bottom of the Rue de la Basse Cour is the Porte de Sillé, a remaining ancient gateway into the town. 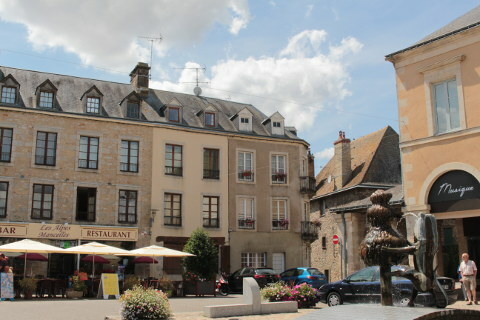 At the centre of Fresnay-sur-Sarthe you reach the Place de Bassum which is surrounded by shops and restaurants and is also home to the traditional market hall, with its sturdy stone columns and exposed carpentry work. From the Place de Bassum you can enter the castle grounds which are now an attractive public garden. 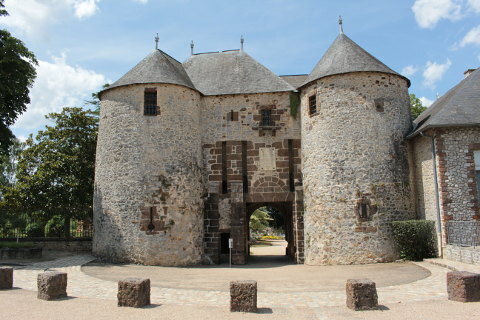 The entrance is through a very impressive fortified gateway. 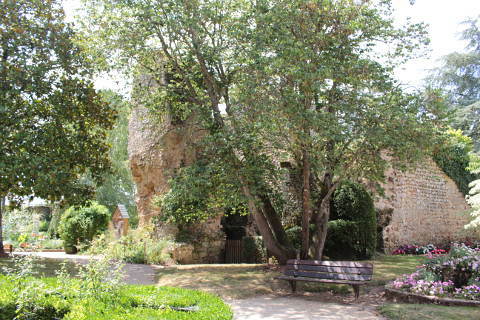 The grounds are edged with the remains of the defensive walls of the medieval castle and you can also see the ruined walls of the original keep (donjon). 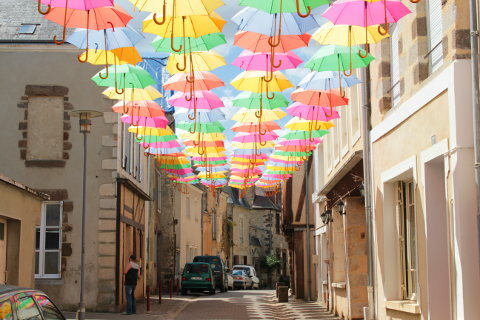 You can also visit he Maison des Artisans (Craftsmen's house). 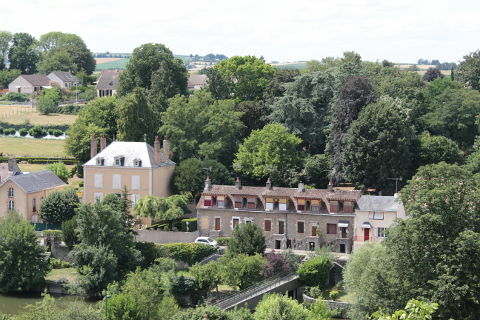 The gardens look over the river and offer great views over a pretty section of the Sarthe river below. The river is edged with lovely houses and a number of wash-houses and can be crossed by an old stone bridge. The ensemble is very photogenic. From her you can walk down to the river for some closer views of the river and the riverside houses. Many of the houses on the river's edge are ancient weavers' quarters. 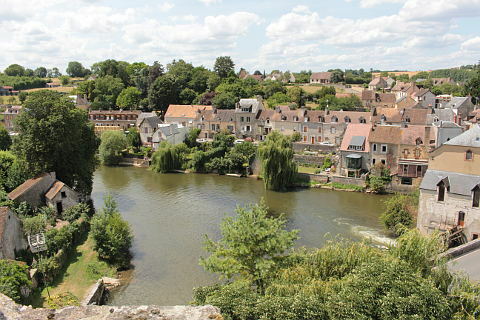 Further round the large bend in the river is the Rue du Bourg-Neuf, which follows along the banks of the river past some more picturesque houses and leads to the Moulin d'Espaillard, a traditional water mill (although the view of the river along here is often blocked by the houses). 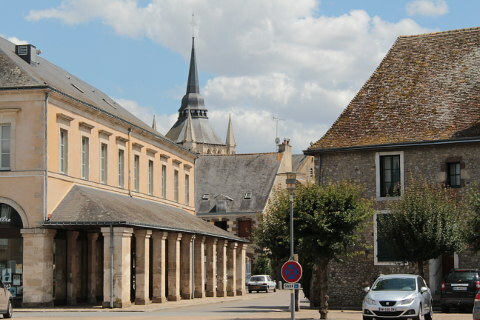 The weekly market in Fresnay-sur-Sarthe is held in the Place de la Republique. One of the most unexpected attractions in the town is surely the museum (the Musée de la Coiffe), which is dedicated to lace bonnets, although with a small deviation to show some historical hats. If nothing else it must surely be 'one of a kind'! 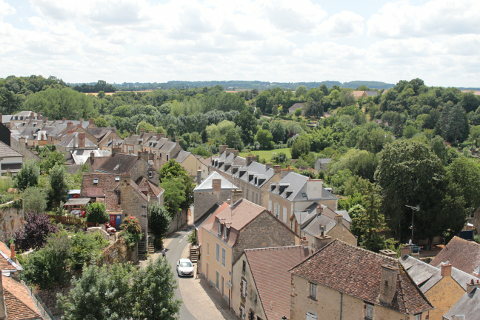 The region around Fresnay-sur-Sarthe and north to Saint-Céneri-le-Gerei is known as the Alpes-Mancelles and is a popular region with those wishing to explore quiet countryside with streams and rivers, fields and small woodlands. The gardens of 'Les Jardins de la Mansoniere' are a treat and gardeners will want to visit. As well as opportunities to enjoy hiking and cycling there are also small villages, gardens and local museums to explore - a pleasant place for a weekend break in the spring or autumn!